Print out the hand puppet pattern provided below. Cut out the pattern and pin to a piece of felt (or fabric of your choice) and cut out two pieces. Glue (or sew) the two pieces together leaving the bottom open. Cut a round or oval piece for each face and clue to the puppet. Draw a nose and mouth. 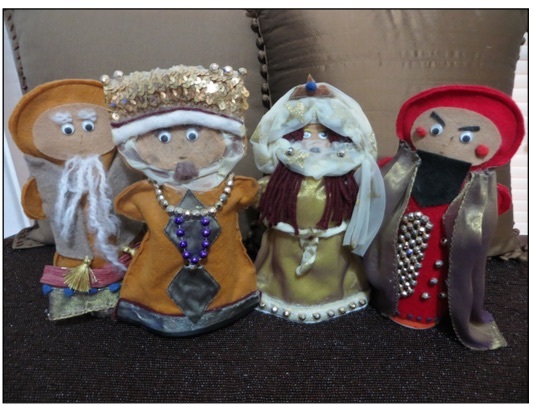 Use your puppets to enact the story of Esther. We would love to see your finished puppets! Note — Gluing can be a messy process. To avoid the front and back from sticking together from excess glue insert a piece of cardboard into your puppet while working with it. This entry was posted in Purim by Cindy Lou. Bookmark the permalink.